On Saturday I went to Shakespeare’s Globe Theatre on the River Thames to see and hear the Stephen Warbeck Ensemble at the Sam Wanamaker Playhouse. 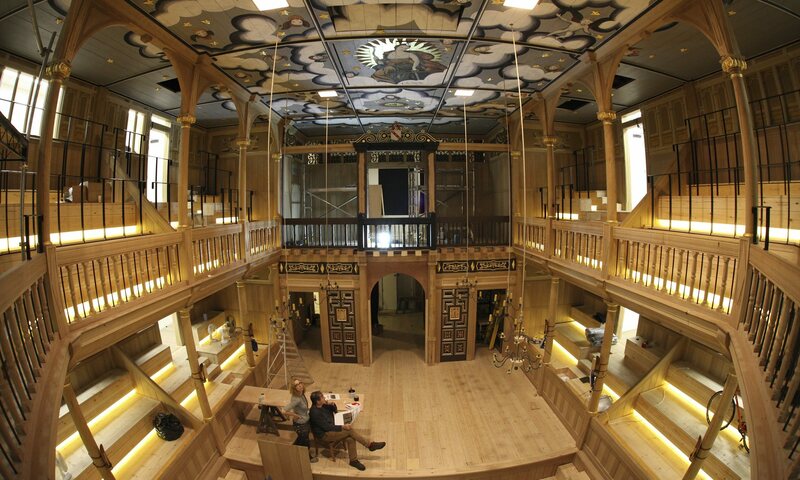 Recently opened the playhouse is a loving recreation of a performance space where Shakespeare would feel at home: a small Jacobean-style theatre lit almost entirely by candles. The evening was a sheer delight, from Warbeck’s entertaining introductions to his exuberant film music enhanced by the pleasure of seeing on stage my son Dario as guest, and even if I say so myself playing brilliantly as he recreated live his recording of the guitar music from Captain Corelli's Mandolin. Next stop: The Glamour of Italian Fashion 1945 – 2014, an exhibition at the beautiful Victoria and Albert Museum which shows how style and romance can come together in a perfect accord of exquisite taste. If you are passing through London, don't miss it. The week proceeded most amiably, for I had drinks with my old friend, guitarist Julian Byzantine, down at the “99” pub in South Kensington, so called because the Royal College of Music round the corner is reputed to have only 98 rooms. The next day I was back at the Royal College of Music itself, stumbled into a brass concert by the Royal College of Music Brass Ensemble and was blown away by Richard Strauss’ tone poem Also Sprach Zarathustra / 2001 Space Odyssey opening theme arranged by Christopher Mowat and directed by Nigel Black. When I say blown away, I do mean the massive sound blast lifted me off the floor and pinned me to the wall, or at least that is how it felt. It left me slightly deaf for about five minutes with my body vibrating all over for twenty – so please don't stop, Nigel, I'll be back for more as soon as I can. Driving home later that same evening I passed my favourite animals out strolling: horses from the Duke of Westminster’s stable in Hyde Park. A few minutes later along the same drive the US Ambassador’s residence lies hidden in the overflowing foliage of Regent’s Park, where a most posh do (related to the 4th July Independence Day celebrations) was taking place judging by the elegantly attired guests approaching it and by the security all around. A few hundred yards away another trot-load of horses: this time police ones in training. From there a descent to Camden Town, where more foreign languages are spoken per square inch than anywhere else I know, and all thanks to the eccentric and charming Camden Market which so fascinates overseas visitors. Within seconds I was home, put my feet up, and watched the film Lost in Translation, a perfect way to wind down from the noise, heat and bustle of London on a summer’s day – so perfect, I fell asleep! I will be in London next week too, let’s see what surprises lie in store for me then. This entry was posted on 04/07/2014 (Friday) at 10:48 am and is filed under Uncategorized. You can follow any responses to this entry through the RSS 2.0 feed. You can leave a response, or trackback from your own site.